Collection of covers doesn't cover any interesting new ground. Weezer hates you because the band truly believes you have so lost the ability to identify and distinguish quality that you are going to spend actual human time with an entire album of precisely rendered cover songs that are, at best, only minimally superior from the originals (and, for the most part, indistinguishable). But, honestly, friends, there is no reason to listen to The Teal Album. There are no revelations, no hearts are placed on sleeves, no one will be moved, and no one will bother to play one of these tracks in the future. There is nothing on display here other than Weezer’s enormous, cynical hatred for their fans, for their industry, and even for their own talent. On Teal, Weezer use their considerable skills to produce a faux-K-Tel album that really ought to be called, Songs That Were on the Radio and MTV Way Too Much When We Were Younger and Listening to the Undertones (and Other Stuff That Wasn’t On The Radio and MTV), Because Once Upon A Time We Actually Had Taste. The Teal Album almost sounds like something someone would make to check out a new studio rig — “I’ll test my new woofy subductor and my Tooly Pro Interface by making a near-precise reproduction of ‘Everybody Wants to Rule the World.’” Heck, all of us who have spent too much time in the recording studio have been in that place. But very, very rarely have we ever been compelled to release such technical onanism, except maybe on the occasional B-side. Weezer have now given us a whole bloody album of this B-side worthy nonsense. Music listeners have to ask ourselves why. 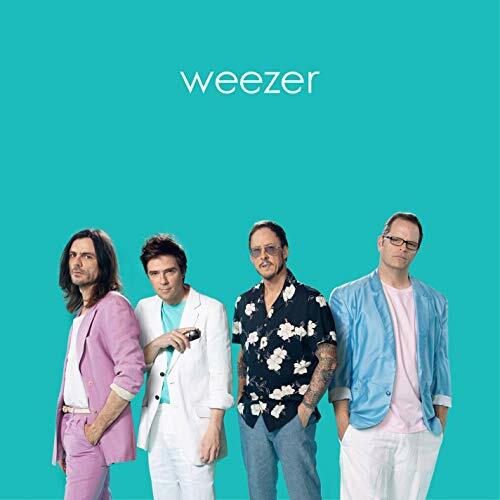 In a second best-case scenario, Weezer are trying to reveal the utter vapidity of the American music industry in 2019 by proving that a completely unnecessary album of uninspiring covers can attain a disproportionately large amount of attention. That would, indeed, be an interesting exercise. In a second to worst-case scenario, Weezer are testing their own skills as engineers, craftsmen, and master forgers. Neil Innes did this sort of thing with the Rutles, and Todd Rundgren did it on Deface the Music. But in both those cases, those artists were composing original songs, which sort-of justified the exercise. The fact is, it seems rather pointless to do it if you are just putting covers out there. In a worst-case scenario, Weezer despise the American music consuming public, and want to prove that today’s consumer will click on literally the most banal and redundant nonsense. I am leaning towards the latter option. It is extremely similar – in fact, indistinguishable –from the self-love exhibited by those guys who sit in the amp aisles at guitar center and play wang-dang-doodle-dweedle-weedle-wang. True, detailed listening to The Teal Album will reveal some interesting touches: a bit of artful subtlety and space added to a bridge here and there; some impressive and aurally-seductive layering of electric and acoustic guitars; and some surprisingly sincere, restrained vocals. I note all this to be fair, because dammit I am fair, and to show that I am not just reviewing this puddle of cold sick based only on it’s track listing. You do not need this record; you do not need to hear it even once. Just ignore this loathsome, repugnant act of conceptual violence entirely. It can be done in the right way: From the early 1980’s through the mid-90’s, the English group Chumbawumba were an arty, aggressive, sometimes dissonant, anarcho-punk band who were deeply committed to meaningful political and social activism. But then they decided that the best way to promote and advance their activist agenda was to have a hit record. So in 1997, they crafted “Tubthumping,” which became one of the best-known pop songs of the decade. This provided them with a level of visibility and media access that they could never have achieved as an underground act. Chumbawumba chose to make something deliberately accessible for the sake of furthering a political and social agenda. Now, Weezer’s The Teal Album is literally the anti-“Tubthumping.” It is a deliberate hyper-pop exercise that empowers no one, makes no one feel better about themselves, and adds nothing positive to the world’s cultural, spiritual, or informational economy. No one gains from this exchange. Weezer isn’t trying to make a better world; they are testing the limits of the rotting, rotten mainstream music business in America, which rewards instant reaction, not the long-term, life-shaping artist-listener engagement. I believe Weezer knows all this, by the way. But they are seeing if you click-click-click-click anyway. And I believe that’s the “big” statement Weezer is trying to make. The band is saying that the extraordinary era of ecstatic, intelligent, and energized pop, punk, and art-pop they came of age in is sofar gone, so minimized by the Quick Click Economy (which rewards baby-legged artistic fetuses like Greta Van Fleet), that there is nothing left to do but release an empty, worthless album that proves that all you people out there are dumb sheep. Which leads us to this: Weezer doesn’t just hate you. They are also wrong. There are gobs of great, new, inventive, feral, fierce, mind-blowing, life-affirming rock’n’roll out there. Why not investigate Mexico City’s Descartes a Kant, the Dodge Brothers from the U.K., Sweden’s Graveyard, France’s Kamerad, and Russia’s RW/Glintshake? That’s the stuff that you should be clicking on, instead of wasting even one moment of this precious human incarnation on this insulting, patronizing, Weezer trash. The Teal Album comes off as an ugly, hateful social experiment, one which you should choose not to participate in.